With hundreds of articles and guides floating around about sales, how many do you actually read, much less retain? Actionable sales tips are like four leaf clovers – hard to find and lucky to have. I speed read a number of marketing and sales articles in a day, but rarely come across actionable advice. Often, actionable advice or tips are hidden under layers of jargon and theoretical musings – this just makes them harder to read and absorb. So what do i actually like? What do i actually retain? Pure actionable advice, tips and techniques which are stripped of all the fanfare and get right to the point. Now that I’ve referred to several legends to get my point across, here are a few actionable sales tips that I’ve compiled over time. One last thing – while reading, do ask yourself if you follow through on these every day. While you may know many of these tips, its easy to forget to follow such basics when we get mired down with daily tasks. 1 – Use prospect B2B data to fuel your sales strategy. Leverage the power of customer intelligence to pitch better. 2 – When doing cold outreach, make sure you have sufficient information about your prospect to not only arouse interest, but create a long lasting relationship. 3 – When running a cold outreach campaign, do not give up until at least 6-7 follow ups. You should not judge a campaign based on the initial email or even a couple of follow ups. 4 – The subject line of your cold emails should never be vague, and most importantly, should align with the content and purpose of your email. 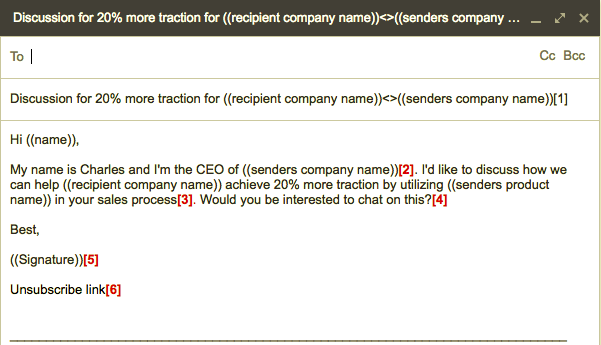 5 – For cold email outreach, always opt to enrich and enhance your data to optimize efforts. Continuously strive for accuracy. 6 – Have a clear profiling procedure for your sales outreach. You will have a better chance of taking the right initiative so that you leave a mark even if you don’t make a customer. 1 – Let customers sell to themselves. You can do this by focusing on ‘intrigued selling.’ Generate inquisitiveness and let your prospect explore your product. 2 – Use the problem-solution method to present your product/service. This allows your prospect to understand what you can deliver and inspires confidence. 3 – Give your warm leads some time to consider your offering – but not so much that they start considering other options. Ideally connect with them once or twice a week during the decision making stage. 4 – Where possible, show your prospect how your product can help solve a specific issue with high quality visuals, graphics, PDFs, videos etc. 5 – Keep smiling – even when on a call with a prospect. It helps you sound more confident and less anxious (and lowers your heart). We all know the pain of chasing after a lead for days, weeks – even months, and the prospect simply walking off with ‘not now, maybe in 6 months.’ No amount of actionable sales tips can stop this from happening. Yes, its frustrating to no end. All that wasted time and effort, with nothing to show for it at day end. Its inevitable that a great many leads will walk away from you due to multiple reasons. However, knowing what a few deal breakers are can help you better retain your leads. What’s more, if you address these deal breakers right from the start, the lead might even consider your offering. 1 – According to Forbes, offering prospects varied pricing options allows them to test drive your products/services before committing to you for the long haul. 2 – Say no to low value sales even to meet your targets. This is a deal-breaker from your side. 3 – Using too many technical terms can result in a deal breaker for the prospect – always pitch in simple, clear and easy to understand terms. 4 – Do not bombard the prospect with your product and sales material – listen to what they have to say first and only show what they ask for. 5 – Understand from your prospect if anything is happening in your target company which could disrupt or jeopardize your sale. 6 – Learn if there are any internal policies or politics at your target account that might restrict implementation of your product/service. 7 – Resistance to change is often a major deal breaker – address any such problems before investing your time and effort in such a prospect. 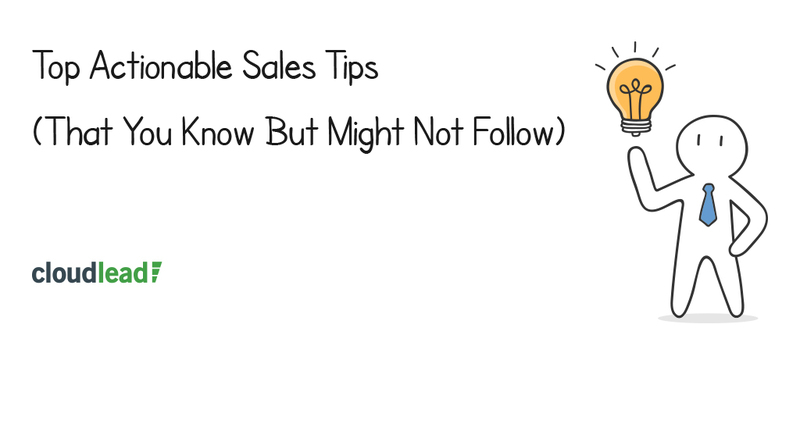 From the various actionable sales tips given here, you can learn 5 valuable lessons. 1 – Get quality B2B data based on your ICP to correctly target lucrative accounts and personalize your sales message. 2 – Cold prospecting requires lots of effort and patience – do not give up on your campaign too early. 3 – Understand your prospect, do thorough research on him before pitching your product or service. 4 – Address any and all objections your prospect might have right at the start of your relationship – later on these can turn into major deal breakers. 5 – Do not over complicate your pitch – be straightforward and explain clearly the problem your service or product will solve.